I love learning languages. Since I picked my first Teach yourself English (in Spanish) from my grandparents place when I was 10 years old, I have been fascinated by languages and language learning, first human languages and then also by computer languages. Aside from English, Spanish and Catalan I can defend myself in German and French (enough to get directions and keep simple conversations up, although the last time I was in Germany all Germans I talked to said I could keep up pretty well... Sure they are polite!). I have also tried learning Japanese and Russian, but didn't make it really far, but there they are waiting for a chance. Recently (in broad terms, it was March 2010) I started learning Icelandic, through a book I can fully recommend called Teach Yourself Icelandic (this is the link for the latest edition, I have the previous one), and as of last week I started to use the more advanced Colloquial Icelandic. I'd love to be a Catalan mathematician in Iceland, but chances look pretty dim so far... The only step I can do for sure is learning the language. I have been on and off learning Icelandic since then, and very recently I passed completely what I call the language switch. When you are starting out a new language, thinking or writing new phrases is usually as follows. You have a thought, you generate a phrase in your mother language (or another language you know well enough) and then you transform the phrase using your current knowledge to translate it, usually word by word and then refining the grammar until you have a phrase in your new language. At least, this is more or less how it works for me in the first days and weeks (for some people I've known, it is always like this). Maybe months, depends on how much practice I can get by. But then, one day this changes. One day, the language switch takes over. Your thought goes straight from idea to your new language. For example, the other day I was thinking some test phrases in Icelandic, about how many languages do I speak. I wanted to express this thought, and it just came out: Ég tala spænsku og catalansku (this I guessed from the way language names are build) sem módurmál. Ég tala líka ensku, frönsku og and then here my language switch left me scratching my head, like when you have something in the tip of your tongue but just can't work it out. 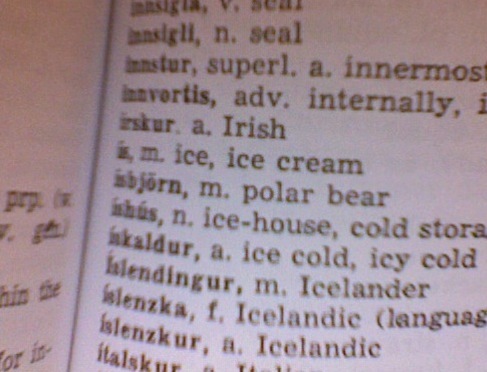 What I wanted was German language, which then I remembered after thinking about some sample conversations from the book, it is þysku (Germany is Þyskalandi in Icelandic). The interesting part is that I didn't 'know' what líka meant intellectually, out of the box. I wanted to express the concept of also, and my language switch knew líka from the examples I had read. When I had the phrase done, I had to think about it to remember that líka meant 'also'. This felt like one step closer to reading Egils Saga in Icelandic, my reading is better as I only need to decode, not encode. My language switch is starting to get Icelandic in. This example also show how I practise new languages. Trying phrases in my head is one of the ways. When I'm walking on the street, I try to 'think' in my target language (like Ég er að fara vinna — I'm going to work) or name objects I see and can name (bíll — car, kona — woman, kaffihús — coffee place). What kind of tricks do you use in your everyday language learning? This keeps on training the language switch, like learning new karate moves. Practising them slowly and increasing difficulty until you can make them perfect at full speed. The more you practice, the more words you learn and text you read will make your language switch be more precise, faster and broader. What are your tips in learning a new language when you don't have time (or know anyone) to talk with a native speaker?